Weird Al Yankovic, LOL! If you haven’t already, go download his song. Now. I guess I shouldn’t be surprised so little media attention has gone to Terrence Tao, the former Adelaide kid and now UCLA professor who won the Fields Medal. A few sources overseas are chattering about the Russian dude who turned it down, but that’s just because he so neatly fits the ‘eccentric maths professor’ stereotype. Thing is, The Planet are huge — so the fault caught this blog, Kitta, Ask A Ninja, and quite a few others. Most other providers (particularly MCI) were able to route around the problem, leaving Feedeye unaffected even though it lives in the same building. I first heard about Last Train To Freo when it started filming — it sounds like a pretty awesome movie from a new local director. The early word is that it’s well-written and well-acted, and it stars Gigi Edgley, aka Chiana from Farscape! My feed reader’s better than yours! So what, you ask, have I been working on while not posting to this blog? The story goes like this. I imagine a few of you reading this will be doing so from the comfort of an RSS reader. I have one too, but I keep encountering a problem. Across all my feeds, there are so many items — some interesting, some not — that I can never be bothered to read every single one. Eventually I figured that what I really needed was a way of highlighting which articles in my feeds were more important, so late one night I took a crack at concocting a way to do this. After some polishing, I dare say the result of my endeavours might be of use to someone other than me. It is (somewhat arbitrarily) named Feedeye, and it’s a Web-based RSS reader that allows you to put feeds into “sets” and will group together items in a set when they talk about the same thing. In doing so, it gives more emphasis to stories the more they’re being posted about in your chosen feeds. 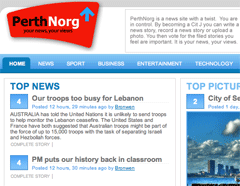 Discoveries in my inbox: PerthNorg! An intriguing discovery in my inbox this afternoon: an e-mail from Bronwen Clune, the founder of a flash-looking Web 2.0-ish news service called PerthNorg. While our other new online news service pays lip service to citizen journalism, this site takes a full-on WikiNews-style approach to local news. There’s Digg-style voting as well (albeit with vote links that aren’t prominent enough) — I’ll definitely be doing that even if I don’t get around to submitting anything. This mix has confused a few people, although I think the implementation has been done pretty well for the majority of Perthurians who’ll have never heard of either. Oh, and I do love seeing proper use of Web standards! I’d actually found out about PerthNorg last week via this post on a Sydney Morning Herald blog (the things you learn reading eastern states newspapers …). But I’ve been busy with honours and work, and marked it in my mind as something to blog about later, particularly seeing as it was so light on content. The site is still light on content, albeit much less so than it was; I’m reluctant to add it to my feed reader until that changes. Indeed, Jeff Jarvis’ excitement aside, I’ve not seen many other localised news plays that are built solely out of user-generated content, so I do wonder whether it will take hold. P.S. The lack of posting here hasn’t been an accident. Announcements are forthcoming, consider yourselves warned!